Alligator (鰐) (ワニ, Wani) is a Chimera Ant squadron leader. Alligator is a fairly large, bipedal, albino alligator-type Chimera Ant with a purple mohawk. 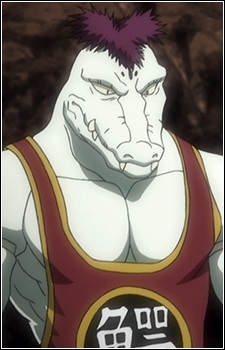 He wears a wrestling singlet with the Japanese character for "alligator" (鰐) written on it.